Um. Um. Um. Um. Where do I begin? The movie was entirely preposterous. There almost wasn’t enough science to make fun of! It ranks way above Sunshine in my ranking of action flicks full of terrible science, and yet it barely holds a candle to Armageddon. Perhaps no one can top Armageddon as the best movie to show an intro Astronomy class: the best movie to ask Astronomy students to rip to shreds. I think we (the astronomy educators of the world) were worried about nothing. If this movie convinces anyone that the 2012 hoax is real, then they weren’t watching the movie. In any case, here goes! NO REALLY! STOP READING NOW! Other Phobias*: “apocalysophobia”, suggestion of vertigo, aviophobia, hydrophobia, necrophobia (fear of losing spouses or children and fear of death), amaxophobia, fear of conspiracy, and fear of flying giraffes. I can’t even tell what planets those are supposed to be they’re so wrong. At first I thought it was Nibiru on a collision course with Earth and the Moon, but since there is no further mention of Nibiru I doubt that’s right. And then there’s Saturn with a stripy-like-a-gas-giant moon. Uh-huh. No, Saturn’s moons don’t have gas bands like Jupiter. And the scale is ALL WRONG on the clip of the Earth and the Moon and the giant coronal mass ejection coming off the Sun. Of course, you couldn’t fit all three in a dramatic image even if you wanted (the Sun would wash out the whole image, and to get the sizes anything like that you’d have to be on the other side of the Moon, not the other side of the Sun) to so maybe we can pretend it is a split-screen shot. Mm-hmm. YES! Okay, they got one thing right. They do not call the giant bubble of Sun-stuff headed towards Earth a solar flare as would be tempting. They call it a solar eruption. Technically I’d call it a coronal mass ejection (CME), but solar eruption is at least not reinforcing a common misuse of a scientific term. Neutrino detector – great, it is deep underground, and it’s got those detectors on the wall to make it look like Super-Kamiokande, but the people climb down inside and the detectors aren’t even in a place where they can detect Cherenkov radiation within the water. The water is through a hatch! And the mine is in India – 11,000 ft deep. Super-K is only 3,250 feet deep. It looks to me like our deepest mines are actually around that deep – but they’re in Africa not India. Some quick look-ups online reveal at least one 2008 paper from Super-Kamiokande (published in the peer-reviewed Physical Review) that shows no correlation between sunspot number (a measure of solar activity) and neutrino levels. It also does not find a doubling of the number of neutrinos detected during Solar Maximum. Of course, this being the cause of the apocalypse in the movie, maybe we should just let them have doubled neutrinos. Except that wouldn’t cause the apocalypse – as they say in the movie neutrinos do not interact with ordinary matter! This is why we have to have super-specialized detectors deep underground to even detect a few of them. So they have to turn the neutrinos into microwaves. Well, what can I say to that? If you’re just going to turn gnats into electricity or elephants into ocean waves I guess you can do anything. Then those microwaves begin to boil the Earth’s core. Oh. This is what I actually worry about. If too many people believe the 2012 hoax, then there will no doubt be a number who take drastic action. Please don’t. You will wake up just fine on December 22, 2012, unless you do something to change that. Suicide is not a good option, neither is anything that hurts you or those around you. If you feel like hurting yourself is a good idea please go talk to your doctor or call your local helpline. The “Maya Prophecy” says nothing about the Sun. The calendar flips over. Ta-da! It confuses me how the cracks run down the middles of streets – turning corners with the street. They worm out of the geology by saying the earthquakes and cracks aren’t due to tectonic shift. It also confuses me that these cracks propagate slowly (at about a walking pace), and that they cut buildings like cake: leaving most of the structure intact. This is a real geology term. It generally requires that the ground be saturated with water and then that an earthquake occurs. It does not mean that the soil turns to water, that rocks melt, or anything like that. Yellowstone is the caldera of a hot spot (not “hot zone”) in our Earth’s crust, and could do some interesting things someday. I’d sure stay away from all volcanic areas (yes, that includes Yellowstone) if the Earth’s core/mantle were heating up. Under the circumstances of the movie, Yellowstone would definitely be unstable. Then there’s something about 2700 degrees C and 0.5% change per hour. Math senses tingling – but I didn’t quite catch everything in this sentence so I can’t actually double-check this. Later on, the way Yellowstone rolls and explodes into flaming balls of lava is cinematography, but how else would you have John Cusack outrunning boulder-sized “meteors” of flaming rock and a rolling ashcloud first in an RV and then on foot? I mean come on! A movie like this needs a man outrunning flaming balls of rock. No. And you should be able to tell that from his character and his animations. Mayan expiration date: yeah, but just flip your calendar and you’re okay again. Alignment of all the planets with the Sun and the galactic center: No. No. No. There is no alignment of the planets in 2012. The alignment of the Sun with the galactic center either happens every year near the solstice or will happen in 2300 depending on how exact you want to be. Does this happen every 640,000 years? It takes us 220 million years to go around the galaxy once, and we go through the plane an unknown number of times during that period. Neutrinos: we already talked about this. Earth’s core melts: a good part of it already is melted! Earth crust displacement theory: There was a guy who proposed Earth Crust Displacement – a massive simultaneous rotation of the Earth’s crust, and Einstein did write a forward to one of his books. It is very important to note that this was in the 1950s – and the currently accepted theory of plate tectonics was not solidified and accepted until the 1960s. My geology professors were not taught plate tectonics when they were in intro geology classes, and now even elementary schoolers can explain it. Einstein was very smart, but he did get things wrong, and scientific theories change as we get more evidence that supports or disproves them. When scientists don’t understand something they propose many possible solutions and then gather data – this helps them choose the theory that is best supported by the evidence. Why would the San Andreas Fault (and all connected faults) be shifting if the earthquakes aren’t due to tectonic shift? Script continuity please! If we’re really having non-tectonic Earth crust displacement due to melting of the subterranean crust and core – and a piece of a continent starts to submerge, shouldn’t it be submerging in the mantle? Why does it look like it is just plain sliding into the ocean? I’m not sure the ocean just off San Francisco is deep enough to slide an entire city into. We’re still on the continental shelf at that point, and you’ve turned the city on end to sink it. I already said it’s preposterous, so let’s look at just a couple pieces. First, it looks like a nuclear bomb blast surrounded by three rings of clouds, probably meant to be shock waves. That looks kinda similar – but scientists aren’t proposing that the smooth white cloud is a shock wave, just a cloud generated by changing pressures. 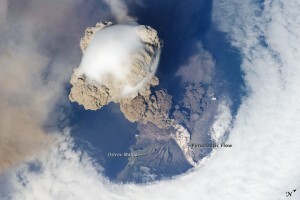 Maybe that’s what the makers of 2012 were attempting to portray – a volcanic plume so huge it passes through three different layers of air creating three different concentric clouds. And yes, you should get away from erupting volcanoes because of ash clouds, superheated ash/rock flows, and worst of all – lahars (superhot, superfast mud flows). Not sure where the lahars would go from Yellowstone, but the best advice in volcano country is to stay out of riverbeds and get to high ground – high ground away from the volcano. These various flows can travel up to at least 300 miles per hour – poor John Cusack he should be so dead. That ash cloud from Yellowstone reaches DC in just about 7 hours. That sounds okay, it’ll be picked up by the prevailing winds and it only takes a plane 5 hours to cross the country. Of course, it will be somewhat dispersed by then and won’t look like the rolling superheated cloud of the apocalypse so much, but depending on how much of Yellowstone you blew up it could make a decent ash layer over most of the country. There really wouldn’t be that much heading towards the West Coast though, the winds will push it back the other way. Seriously folks, you’re destroying the world, dumping entire cities into the sea, blowing up continents, and yet somehow, miraculously your cell towers are undamaged and you have signal everywhere? Cell phones are NOT satellite phones, they rely on cell towers. Cell towers are anchored to the ground. Almost every time we see a plane take off, the runway crumbles away beneath it, and the plane goes off the end into a chasm, because it hasn’t reached take-off velocity yet, only to see that plane plummet a few stories, gain control and pull up out of the brand new canyon. This is okay – planes are made to fly – that’s what a wing is for. Engines just give you speed. If you’re already airborne, and you’ve got a good pilot, you can glide the plane until you get your engines under control. And if you need more speed, what better way to get it than going down? Gravity-assisted take-off, I say! So we end up with the South pole somewhere in Wisconsin. The mechanism is all off, the timeframe is unpredictable, but yeah, the magnetic poles reverse every now and then – every few hundred thousand to few million years. This should not be related to Earth Crust Displacement theory or 2012. I would like to analyze this in more detail. Suffice it to say for now – I think the car should be moving in the same direction as the plane when the car’s wheels touch the snow. If anyone wants to crank out some math and force diagrams on this with me, that’d be great, I don’t have time at the moment. Two warnings. 1) You’ve got 20 minutes of Titanic to sit through here, but you’re almost done. 2) The drowning scene is not nearly as realistic as the one in the recent Bond flick: Casino Royale. You can probably handle it. Now we have mountain-high tsunamis, and our cell phones STILL WORK. There’s this fascinating thing that is about to happen – with the pretty “v”-shaped cleft that the arks are positioned at the end of, you’ve created what looks to me like a perfect tidal bore: a path for a wave to travel, gaining energy as it comes towards you until you’re hit with the brunt of the energy much harder than you would have been had you been at the mouth of the valley, rather than the back of it. This is what will happen to Olympia, WA if a tsunami ever is positioned just right to enter the Straight of Juan de Fuca and comes crashing down through Puget Sound. Olympia, albeit farther from the source, will be hit harder than Seattle. Okay, when you designed your arks, and you designed the anchors to fail after the first crashing tsunami, why did you not also design them to withstand things like: crashing into each other, crashing into large debris (like airplanes) in the water, and crashing into rocks? Did you assume that after your anchors failed at that first wave the seas would be calm and you could float peacefully under a rainbow looking for a dove to return? Africa gets uplifted, but at this point you can do whatever you want with the tectonic plates because you’ve set up a completely fictional idea anyway. So they set sail and ::phew:: we open the gates and breathe fresh air again. *If you see this movie and you think of other fears it may raise let me know and I’ll add them to the list. Good review, I can forward it along to the friends that won’t stop bugging me to see it. Sounds like a good movie. Science fiction has always been an interest of mine. It would be cool to see the part about Yellowstone. Thanks. I do so enjoy scientific analyses of movies. They make for such a contrast with the real world. Hey, thanks for the breakdown of the movie – I really appreciated reading your scientific review of the movie. I saw it last night, and while I really enjoyed the special effects, the bad science grated on my nerves a little bit. Glad you enjoyed my post Dharma. After I read your wonderful review out loud to my husband, he replied “You talked me into it.” And left to go see the movie, sigh. I think I agree entirely camazotz! Hey, nice review and scientific analysis. However, you do know that it’s a movie, right? I mean, it’s ok to present goofs and errors in the movie (for which I would rather go IMDB), but to get so personal about it… I dunno. Of course it’s about our planet, so it should respect our physics and geography and whatnot; but again, it is a movie, and it’s a sci-fi for that matter. You are presenting the goofs in a manner which makes the review look more like a frustration at how much fail the movie was. MOVIE. Not reality show. Flicks over the years have been known to disgrace every scientific fact ever; if we would stick to the rules then I guess it wouldn’t be much of a movie, would it? But it is indeed a good review. Although I assume one should be extremely ignorant not to notice some of the most obvious goofs, such as the planets seen from outer space. I think you missed a few goofs, though – the Antonov (or whatever the huge plane was) had its landing gear destroyed, therefor the initial plan to land in Hawaii was pretty stupid. And since we’re in Hawaii, they should probably think twice about landing there, since Yellowstone erupted not long ago, and considering the Pacific’s ‘fire ring). :) Thanks for pointing out some of the stuff I missed. I’m sorry I was unclear in my first paragraph. I, like a number of other people, LOVE watching movies in order to nitpick the science. I find it fun, and love getting my money’s worth of nitpicking in. Now, some of the nitpickers out there get angry about the mistakes. As tone of voice doesn’t come though perfectly in writing, I can see how it might seem that my review is in that category. I will work on portraying myself more accurately. I mostly get angry when incorrect science is used in such a way as to convince real people to do harmful things in the real world. Being scared during the movie on behalf of the characters is one thing. Being scared in the real world of something entirely impossible that you’ve been told is “science” is another. You’ve got a great handle on this – you’re SO RIGHT it’s just a movie. Which is why I had a great time writing up this review and retelling the plot to my friends and laughing at it. Good summmary…I will add a few things since it is hard to catch everything! First, the weird neutrino phenomena. If this could happen we would know it by now. There are a couple hundred billion stars in our galaxy and I bet, if this could happen, other stars would be doing it. These neutrinos are easily detected in the movie (much more easily than regular neutrinos) so we should be detecting these things from other stars (in low numbers at least) all the time! Next, the mountain in Yellowstone where they watch the eruption is listed at an elevation of 2300 and some feet (they said this and it was printed on the sign). No where in Yellowstone is 2700 feet! The whole place is above 7000 feet in elevation. Could they have meant meters? Okay, nit picky but should be obvious to anyone who has ever been to Yellowstone and tried to breathe there that you are at a significant elevation. As the plane takes off from Yellowstone, it is overtaken by the blast wave from the volcano. Planes need to attain certain airspeed (in the case of this plane I believe he said it was a little of 80 knots when they took off from LA). If you are inside the shock wave moving at the same speed as it, your airspeed is zero and you are NOT going to get airborne. Mount Bighorn (the mountain that they claim to be on top of when the volcano goes off) actually exists in Yellowstone and I’ve hiked it. The actual elevation is around 9920 feet. Also, there is absolutely no way you could get an RV anywhere near the mountain due to the terrain, there aren’t roads for miles around. Movie summary – explosions were fun to watch. Science was so bad that I had trouble suspending disbelief, meaning that I was laughing too hard to enjoy the movie. And really, if these super mutant neutrinos are heating things up in the centre of the earth to the point where the water is boiling and people are made mostly of water… Why didn’t we just boil inside our own skins way before the ‘disaster’ actually happened? Excellent, Jana! I thought of that after I posted my little remarks. Just another little quip: I thought the conventional myth is that the Mayans predicted the end of the world on December 21st, 2012. Did it look like December weather in Yellowstone when they were there? I liked it and I would like to consider the true part of it. The part that the authorities lie to save them and some other for money, the fact that everything would change, Einstein supported it. That is interesting. Science fitcion is like that … some is real some is not… otherwise that would be a documentary… which is not the case but is interesting to know that this theory exists. Under the Yellowstone park is a huge mass of magma and is well known this will be a volcano some day .. and this volcano alone seems that could kill one fouth of the entire population. I agree that science fiction is not meant to be a documentary! :) That’s why I watch more science fiction than documentaries. For the rest I’m going to say yes with caveats. Yellowstone is a hot spot. This does not necessarily mean it will become a volcano. It could, but it is more complicated than that since magma occurs in places other than just volcanoes. It is most definitely volcanic – and the region is most definitely geologically interesting – and the fact remains that it could become unstable which wouldn’t be too good for anyone in the area. Hey there! Thanks for that AWESOME review of the movie. Your review had me laughing for the whole time I read it. I would like to point out that the Yellowstone hot spot (also called a Super volcano) would not erupt as the 2012 movie depicted. Super volcanoes erupt in different ways than regular volcanoes. The caldera of the Yellowstone super volcano is very large. When magma finally erupts, the material atop the caldera collapses into it. This produces several columns of magma around the rim of the caldera. The magma, dust and gas is ejected as far as 50 kilometers into the atmosphere. Some of this material, being too heavy to remain in the atmosphere, plummets right back down. The ash cloud from a Yellowstone eruption would circle the earth and block out the sun for a very long time. Anyone within up to 200 miles of that volcanic blast would be vaporized instantly by either the initial blast, the falling debris or the pyroclastic cloud. John Cusak and his family, standing that close to the eruption, would have been toast. If, by some miracle of divine intervention, the blast did not do the job, there is no way that any vehicle could outrun a pyroclastic cloud like that. None whatsoever. Planes and automobiles would not be able to function in the falling ash, which, by the way, would be raining down in a radius of 600 miles. Volcanic ash clogs up machinary, at least in that kind of volume. ALSO, Mr. Cusak’s family should have been choking on the volcanic ash that should have been pouring down on them. When volcanic ash enters a human’s lungs, it basically turns to cement. Want a reference for that? Simply look up Pompeii. At the very least, that family should have been deaf from the sonic boom of the explosion. As for the dead buffalo, that was one of the realistic effects of the movie. Before a volcano erupts, it slowly begins to emit gases that typically kill plant and wild life. I know 2012 is not a documentary but at least for normal people like me with a little knowledge about science its a little insulting and makes the movie not entertaining at all because you are always thinking thats not possible AT ALL. Even from a movie making point of view you have to take that into consideration. Everst is what 6 miles high where did all the water to flood the world 5 miles above sea level come from. Otherwise it wouldnt have taken 30 days for the water to receade. If between the mountains was full of water the valleys would look like damns broke. How about the people standing around the volcano and suffering no adverse effects? Volcanic gases? Hello? Good Review Alice… it had confirmed my questions also. The Drakensberg does not lie within The Cape of Good Hope like they state at the end of the movie, I have been to both places and they are pretty far appart. The Cape of Good Hope is in the Western Cape province of SA where as the Drakensberg are located between Kwazulu-Natal and the Free-State. It was fun for fun’s sake, probably less of an agenda disaster film than most in the Global Warming era, and meant for popcorn and laughs, not classroom pondering. If it had been crafted by more knowlegdgable people, it’s audience may have expanded or contracted, but the businesses in charge of movie making would not have cared either way since they are capitalizing on a buzz moment in human history, the money it could make as entertainment, and not the use of it later as text. Maybe all these movies where nothing of the like is happening here and now label the prologue as “on another earth where the psychics are strangely not our own . . . ” Now, how do the Discovery channel movies/documentaries hold up in theater critics review? The earths inner core cannot melt anyway because there is so much pressure around it. Oh thank you for noticing the cell phone problem–that kept me cracking up throughout the entire movie and I wondered if it was just me . . . I could enjoy the special effects without being too distracted by reality, but really . . . working cell phones? No wonder we never saw the Verizon guy in the film; probably everyone could hear him with the new cell phone technology that doesn’t require either towers nor a stable atmosphere between earth and the nearest satellite. Where can I sign up? oops grammar . . . cell phone technology that requires neither towers nor a stable atmosphere . . .
I’m kind of in love with this review. Thank you so much it has helped me heaps with an assignment and is just so interesting!